For travelers who want to soak up the bliss that defines Negril but not spend a fortune on accommodation, Xtabi on The Cliffs in Negril, Jamaica is the ideal place to stay. Nestled among the jagged cliffs that line Negril's West End, Xtabi is a small, intimate and rather quaint resort that boasts a nice variety of clean and spacious rooms to satisfy all budgets, and efficient, friendly service from the receptionists, management, and restaurant staff. Half of the property is located across the road from the sea, where standard but comfortable sleeping rooms are set against lush gardens and a well-kept swimming pool. If you are budget conscious, book a standard room in this area of the resort. The upper floor rooms are splendidly airy with high ceilings and balconies, some with views of the sea. Lower floors all have verandas that step out into the resort's gardens. This feels remote at first, but once you cross the road and get a glimpse of the view, you probably won't be spending much time in your room anyway! The cliff-front side of the resort is freckled with funky, colorful cottages that sit atop the island's ledge, all surrounding an appealingly mellow bar and restaurant space from where you can lazily waste away the entire day, then enjoy a banana daquiri as you watch the sun spectacularly fall into the turquoise waters of the Caribbean Sea. Sturdy ladders are built into the cliffs, offering an easy path to climb down into the cool water and explore the many sea caves and reefs below. If you are feeling adventurous, you could just dive right in - as long as you are given the "OK" from Andrew, Xtabi's hunky, daredevil watersports and diving guru, that it is a safe point from which to dive. I was with a friend, and as two female travelers we felt completely safe and secure at Xtabi. We would often leave our personal belongings on lounge chairs when off snorkeling or swimming, and never once feared that something would get stolen. We felt as though the entire staff was looking out for us, and was helpful and kind if we needed anything at all. As well, we appreciated being able to walk nearly everywhere we went. 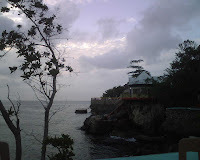 West End Road is not nearly as dangerous as some have made it out to be; from Xtabi we walked with ease to many of the surrounding resorts, food stalls and restaurants - including to the gorgeous Rockhouse Hotel. Of course, as you would anywhere, be safe and look both ways before crossing the very busy road! All in all I loved Xtabi, and would highly recommend it to all future visitors to Negril.